Options to go or start different forms of Text Chats. Goto Chat is Group Chats (and/or Chatrooms). The other going up the list from there are Direct text chatting (iChat will convert to this if you send a file or picture during the top option of Text Chatting). 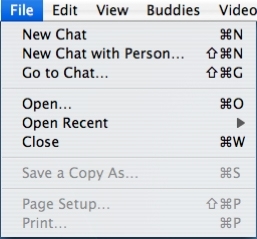 And of course the top option is plain Text chatting. In iChat 3 and 4 this will depend on the front Buddy List as to which sort of Chat it is. Plain Text chatting is to one person but it happens over port 5190 on the TCP protocol. Direct chats, Sending files and Pictures happen on port 5190 on the UDP protocol. The Open and Open Recent options are to open chats that you have Saved. In the case of Open Recent it is about reopening Chats you have opened before. You can not open chats you have not Saved. Nor is it a feature to reopen/restart a Text chat where the window is still on your Desktop but the other person has left. These pictures are from iChat 3.